From a design by Peter Holland, published in the 'Model Maker' June 1955. Probably the first design for a walking vehicle to be published in Britain as a construction project. Size - 12" * 5" * 8". Based on a design by A B Orr, Newnes Practical Mechanics July 1962. Following Grey Walters machines it is probably the first published design for a phototropic vehicle. Won a Gold medal at the Robot Olympics, Glasgow 1990. Size - 6" * 4' * 6 1/2". Based on a design by Peter Holland, Radio Control Models & Electronics, December 1964. Probably the first published design for a photo- tropic vehicle which didn't follow Grey Walters design of a scanning turret coupled to the front wheel. Instead Fred's turret independently rotates and a sensor integrates the light level over the Port and Starboard sectors and directs the steering to head to the brightest sector. Size - 5 1/2" * 4" * 4 1/2". Based on a design by G Drapper, Radio Control Models & Electronics, March 1965. Probably the first design for a phototropic vehicle which didn't use a scanning turret. Size - 6" * 6" * 3 1/2". Based on a design published in Everyday Electronics, June 1975. Probably the first British published design for a Line Following vehicle. Size - 5" * 4 1/2" * 3". Based on a design published in Elektor, June 1980. Maybe the first published design for a robot vehicle using ultrasonics for obstacle detection. Uses an ultra-sonic beam to detect obstacles, avoidance is by random back-off and turn behaviour. Size - 5" * 3 1/2" * 3". A micromouse, which uses vision to detect the walls of the maze, segmented bump sensors in case it doesn't, and a layered behaviour control program. Finalist in the Robotics Age "Home Robot Photo Contest". Article in Robotics Age Jan/Feb 1982. Photograph of Quester used to illustrate an article on mobile robots, p641, The Home Computer Advanced Course #33, 1984. Photograph - Scale Models International, April 1988, p207. Size - 8" * 5 1/2" * 7 1/2". Computer controlled Turtle using an Infra Red communications link. Won a Bronze medal at the 1988 International Model Engineer Exhibition, London. Size - 10" * 10" * 5". Black vehicle, the prototype Zeaker. A computer controlled micro robot vehicle attached by an umbilical to its control station and host computer. Size - 5 1/2" * 5" * 2 1/2". White vehicle, the production prototype Zeaker. Published as a construction project in Practical Electronics May & June 1983 and sold by Colne Robotics. 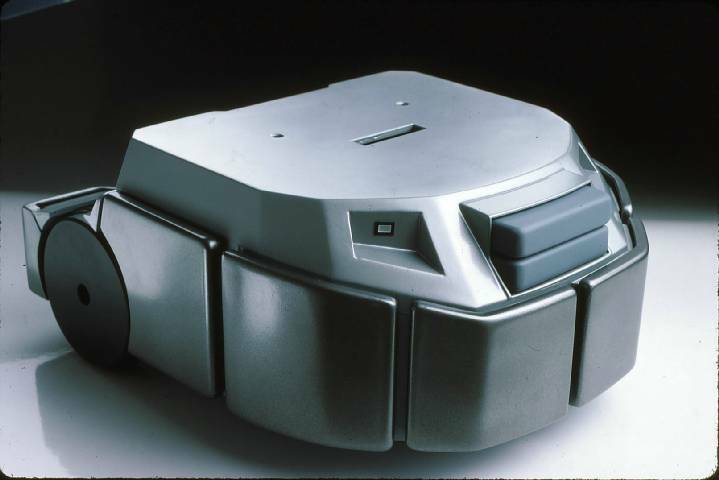 Zeaker was the first British computer controlled micro robot vehicle to have comprehensive segmented bump sensors. Illustrations of Zeaker used in The Usborne Practical Micro Book, p49, p75, 1985. Highly Commended at the 1988 Model Engineer Exhibition. The first design published in Britain for an expandable micro robot vehicle. Controlled over an umbilical from an host computer. A simple stereo scanning camera for a computer. Published in Practical Robotics, July 1984. Size 4" * 4" * 4"
Designed and fitted out by D L Buckley, chassis built by David Joseph. A self contained modular robot vehicle with obstacle sensors and obstacle avoiding software. Size - 13" * 10 1/2" * 6"
Expandable Turtle controlled over an umbilical from an host computer, driven by stepper motors and capable of precise movements. Four Legged Walking Robot, uses 3-D pantograph arrangement to produce a gravitationally decoupled leg mechanism similar to that used by Shigeo Hirose, A Study of Design and Control of a Quadruped Walking Vehicle, The International Journal of Robotics Research, Vol 3, No. 2, 1984. Won a Silver medal at the 1988 International Model Engineer Exhibition, London. Design and building started September 1987. Size - body about 6" * 6" * 6", legs extend to about 15" * 15". A two legged human sized pneumatic powered walking robot. Design and building started 1988. Now in the Permanent Collection of the Science Museum, London. Designed by Jonathan Connell and published in Omni October 1988. A self contained robot vehicle with an electronic neural control circuit with layered behaviours. Built as published May 1994. Size - 9" *�5" * 4"
A self contained mobile robot, will be equipped with a vision system and arm and gripper. Sometimes controlled over an umbilical from an host computer. A self contained six legged walking vehicle using 12 model-control servos, it has an onboard control computer enabling it to walk whilst avoiding obstacles. Design and building started September 1994. A self contained mobile robot able to navigate in an unstructured environment and coexist with human and other reasonably sized animal life. Multiple sensors and multiple sensor systems. Data fusion via behavioural fusion control strategies. Design and building started September 1993. Size - about 26" * 18" * 36". Micromouse - Intel AH-52 Basic, stepper motors. A sub miniature self contained robot vehicle with onboard computer programmed in a high level language, capable of seeking light whilst avoiding obstacles. Uses a five layer behavioural control program. Size - 1.5" * 1.9" * 1.3". A six legged self contained walking robot vehicle able to cope with unstructured terrain, to be equipped a vision system for terrain mapping and object location, and a limb and gripper for object retrieval. A micro miniature self contained robot vehicle with onboard computer programmed in a high level language, capable of seeking light whilst avoiding obstacles. Uses a layered behavioural control program. Groundhog class Mars tug, rough terain vehicle with onboard computer programmed in a high level language, capable of seeking light whilst avoiding obstacles. Uses a layered behavioural control program with intrinsic sensor fusion. Uses a Basic Stamp BS1. A micro miniature self contained robot vehicle with onboard computer programmed in a high level language, capable of seeking light whilst avoiding obstacles. Used a cut up Basic Stamp BS1 SIL version. Used a Basic Stamp BS1. A minimal wheeled robot built from coloured cardboard using hot-melt glue. Capable of seeking light whilst avoiding obstacles. which I gave to the Props department at the Royal National Theatre, London. 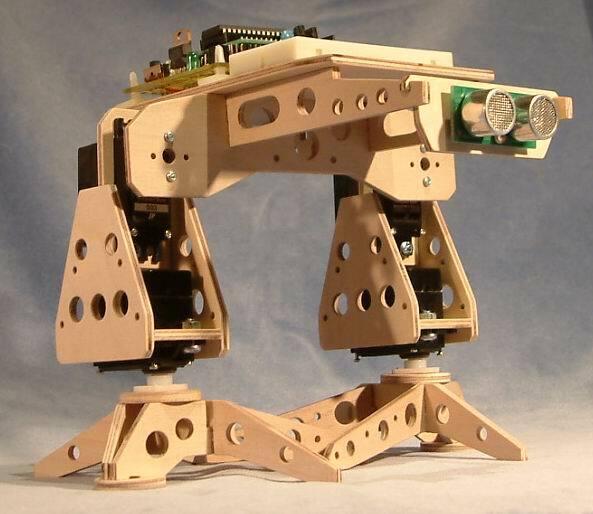 A two servo biped walker. sold under license by Milford Instruments. 2 foot high autonomous, 5 servo, biped robot. demonstration item for Tile 2000, Bob Hope playing golf - holed 15 foot putts with ease. Caddy - lifting the flag out of the hole and watching Hope and the ball, - Multi-direction head and moving arm. All the watchers looked back and forth at each other until Hope was ready to putt, then they looked at him and followed the ball to the hole. 10 processor autonomous hexapod robot. Tales of Tameside, Setantii Visitor Centre, Ashton-under-Lyne. 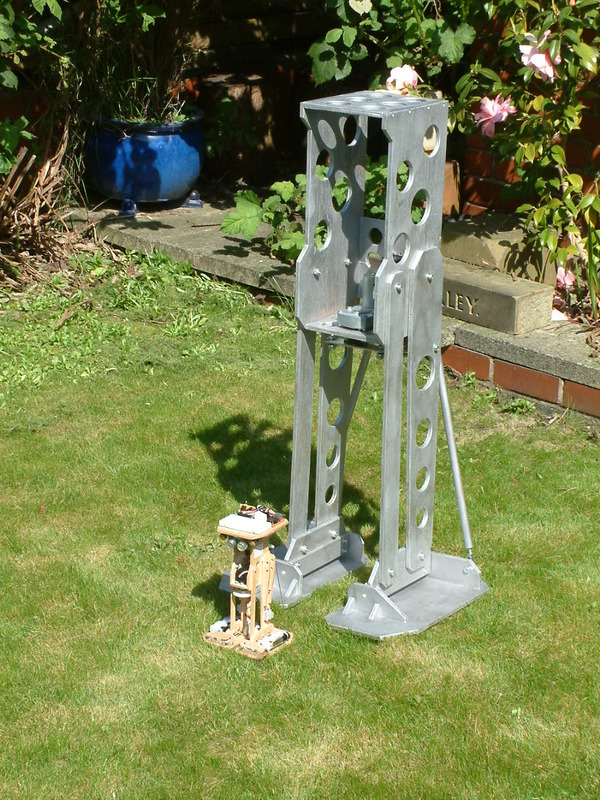 A mobile base for the TecArm and TecGrip, not put into production. Designed Jnuary 2003, Built July 2011.
figure with animatronic head and 'writing' hand. seated figure with animatronic head. The Princess Royal Class Locomotive Trust. Shadow Robot Co. for North Carolina A & T University. animatronic head for a Swedish museum. Animatronic Dinosaur with moving eyes, for Newcastle Natural History Museum. Animatronic Dinosaur with moving head, for Newcastle Natural History Museum. PicAxe controller Designed August 2011. Arduino controller Designed August 2013/14. Scale Models International, Argus Press, Hemel Hempstead. The Home Computer Advanced Course, Orbis Publishing Ltd, London (Published in Europe, South Africa, New Zealand, and Australia). The Usborne Practical Micro Book, Usborne Publishing Ltd, London, England, 1985. ISBN 086020 797 8.